(Chicago, IL) — January 5, 2010. 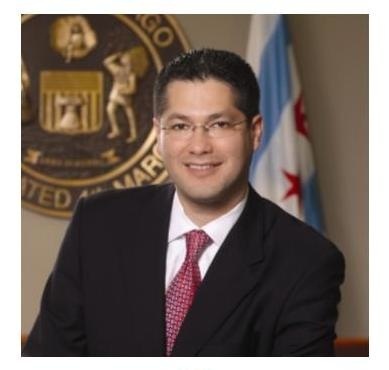 Governor Pat Quinn yesterday announced the appointment of Chicago Alderman Manny Flores as Chairman of the Illinois Commerce Commission. “Manny Flores is an experienced and highly-regarded public servant who will provide a fresh viewpoint at this very important Commission,” said Quinn. If confirmed, Flores would be the first Latino Chairman of the ICC. Elected as 1st Ward Alderman in 2003, Flores has served in numerous capacities, including on the Capital and Technology Development committee and the Energy, Environmental Protection, and Public Utilities committee. “I want to thank Governor Quinn for the appointment and I’m proud to serve the state of Illinois as the Chairman of Illinois Commerce Commission,” said Flores. Meanwhile, Candidate Pat Quinn tonight will attend the Hispanic American Labor Council “Meet the Candidates Dinner,” to be held at Mi Tierra Restaurant in Chicago. You gotta imagine that Quinn’s reception at Hispanic American Labor Council event will be a wee bit more enthusiastic now coming on the heels of Flores appointment, no? What a lucky coincidence of timing.